The shape of things to come. Northbourne Avenue, a boulevarde of trees and multi-unit housing. The bush capital is dead. Long live modern Canberra. Will that be Andrew Barr’s epitaph? In a flurry of planning activity at the end of the year the ACT Government now has three big strategies in place that will set the course for Canberra’s future development and way of life. In short, taller, denser and defined. And King Car is dethroned as we walk, cycle and catch the bus or tram. In order, we have seen in the past few weeks the Planning Strategy, Transport Strategy and the City and Gateway Framework. But they merely set the scene for what will be a decisive 2019. They all provide an overarching vision but it’s what comes next that will really decide whether all the fine words of the glossy documents are carried through. Next year’s review of the Territory Plan will be, as chief planner Ben Ponton says, where ‘we get into the nuts and bolts, the detail where we will develop these areas’ of the Planning Strategy, which envisages a city of half a million strong with defined boundaries and urban sprawl curtailed. Promising the high quality public spaces that the community has demanded, Mr Ponton is quick to assert that the planning authority, under fire so often for waving developments through and not enforcing its own rules, is up to the job. “I can assure you the planning and land authority takes its responsibility of assessing proposals against the Territory Plan very seriously, and we’ll continue to do so,” he says. The Transport Strategy – with its overall aim of recalibrating how we get around the capital with a mix of carrots and sticks that will see more people taking public transport or walking and cycling, particularly in the new built-up areas to come – now goes to public consultation from which an implementation plan will emerge. It cannot be divorced from the planning aims of more concentrated urban development in the Town Centres and along transport corridors, and denser suburbs, where infill and dual occupancy development will be encouraged. A proposal for 40km/h speed limits in suburban streets is a sign that our suburbs are going to be busier and that the car will not have free rein. 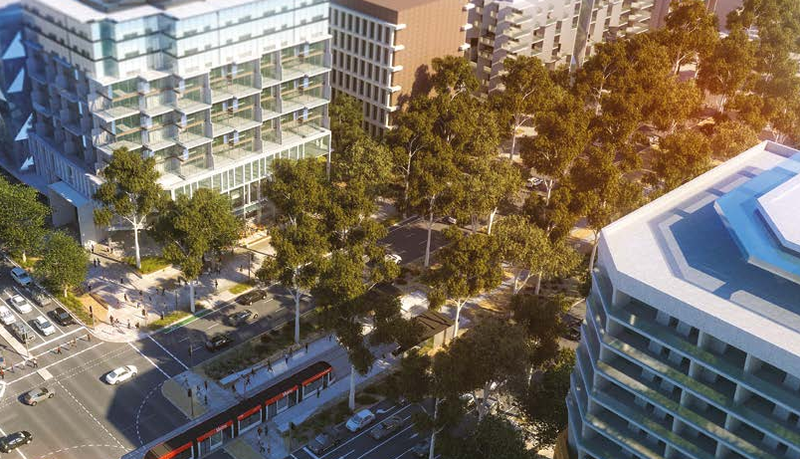 The third planning plank, the City and Gateway Framework covering the northern approach to Canberra along Northbourne Avenue and the city itself, will precipitate changes to the National Capital Plan, again subject to consultation but from there into law. The Framework says the population of the city and gateway area is about 54,000 and is projected to reach 71,000 by 2031. It estimates that there are 17,250 dwellings in the area and it has an overall growth capacity of 37,000 new dwellings, with up to 8000 new dwellings and 12,350 new jobs accommodated in the city centre by 2031. 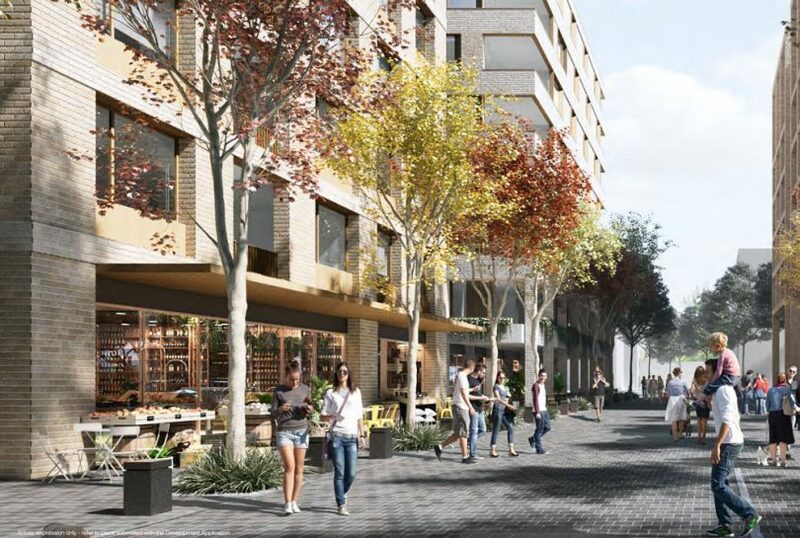 Its graduated approach along Northbourne will see taller, mainly multi-unit housing along the corridor as one nears the city, where there is scope for renewal of existing developments and underutilised sites, such as surface car parks. Like the planning strategy, the intense development is to be defined by a people-centric approach, good design, vibrant activated spaces, integrated transport with walking and cycling links, and the living green infrastructure of open space and trees. Although the emphasis is on quality over quantity when it comes to parks. Spaces for people: An artist’s impression of what the new Dickson may look like. It is a grand vision for a modern capital very different to the spacious landscape many have grown up with or escaped to from the megalopolises of Sydney or Melbourne. Canberra is about to eat itself to provide the housing needed to cater for its projected population, and the face of its suburbs, and how we raise our families, will change forever. Planning Minister Mick Gentleman insists the Government has got the balance right, and as he repeated several times at the Planning Strategy launch, it’s what we asked for. “The bush capital is here to stay, that’s what Canberrans want to see, that’s what we want to deliver as well,” he says. But with greenfield development limited, and the weight of new housing biased toward apartments or smaller homes on smaller blocks carved out of the bigger ones in our suburbs, Canberra’s built environment is going to be bigger. Already there are signs all over Canberra declaring that this space is reserved for future development and a coming review of concessional leases will be part of the hunt for land. Mr Gentlemen was quick to rule it out for now, but the grazing leases such as the Curtin horse paddocks surely must be in the Government’s sights. Despite the planning vision of quality spaces and living infrastructure, and acknowledgement of urban heat islands and climate change, there is going to be more concrete, more glass and less room for the trees and vegetation that mark Canberra as the bush capital. The devil will be in the application of the planning rules, which many say are already flouted or circumvented in various instances. Developers, the recipients of so much flexibility in recent times, have to make a buck, and the question remains whether they will wear the extra burden and cost of creating those quality spaces, sustainable design and greenproofing that the planning documents envisage. With the wave of development that the Planning Strategy and the City and Gateway Framework, combined with the ongoing light rail project, will unleash, it will be vital that the planning and land authority and building regulator be properly resourced so that it can assess development applications properly, enforce the planning rules, and ensure that building quality, already a hot issue, be maintained. That means more skilled staff and more willingness to flex its powers. For Andrew Barr, the alternative of more urban sprawl is just not viable and the only way to go is up. For the property industry, the planning vision will ensure the good times continue. Time will tell if Canberra succumbs to the concrete jungle or whether it can densify and still wear a green cloak. Mr Ponton obviously believes Canberra can and will. We need to hold him to his word. These strategies all demonstrate the Barr government’s reluctance to devote sufficient resources to enable a comprehensive analysis of urban issues. In the planning strategy the fundamentals of metropolitan planning are absent – analysis of the economic, environmental and social implications of alternative land use distributions, transport and housing choice and affordability. (e) Substantiate the trend to smaller households represents a preference for higher density housing. The increase in demand for such housing could be a product of congestion and high housing costs. If insufficient land is provided for detached housing, demand will shift over the border resulting in increased travel and associated greenhouse emissions, reduced population based grants from the Commonwealth, reduced conveyancing and rates revenue to the Territory and impose additional costs to the ACT in servicing the regional populations. In many ways it is a repeat of the fiasco extension of the light to Woden where the government has been unable to justify the project by analyzing alternatives, demonstrating the urban renewal and economic benefits of the soon to be superseded technology. Wouldn’t it be smarter to sack the Planning Directorate and start again? I’m just not sure our population is anywhere near the levels required to spend such a large amount on the varying transport infrastructure that is being planned. The Government and Developers keep comparing our future transport problems with Los Angeles and Sydney and are planning our transport futures in line with Bergen and Freiburg. The Canberra population inside our current Urban footprint of suburbs, would have to increase to over 2 million people to have similar population density as Freiburg for example. It seems clear to me why Andrew Barr hasn’t filled the Chief Demographer and Chief Geographer positions for Canberra. He would rather rely on his Chief Planner to spin the data to match the story he wants. Anyone notice how no one refers to the Griffin plan any more. Sounds like a stitch up between Barr and his developer mates. You only have to look at central Gunghastly to see the future. It’s not pretty. The city is going to change. We are not building over the nature reserves or grassland in the city. How is building upwards in some areas ruining the bush capital? What's the other solution? The ACT government has no real control over how many people live here. The ACT Liberals haven't said a single thing they are going to do somehow its all magic, they just want to get elected and have no other plan, because there isn't another viable plan. Yes, if people want to complain about increasing population take it to the Federal Government, and you can always vote for representatives who believe in smaller population. That's how to make your voice heard, not grumble about the local government responding by trying to cope with increased population. Non ending sprawl is not the way to cope. So where will the green parts be? We expand upwards and replace oceans of concrete surface carpark with underground parking and businesses and residences above instead of wiping out all the green space for McMansions. Densifying is the only option. Anything else is a fantasy. The population will not stop growing no matter how much wishful thinking and nostalgia you employ. Stuart Herring That was not an actual question, lol. It is pretty obvious that when single dwellings get razed in order to replace them with eight new townhouses, a green area is lost. Multiply that out, and you have a city with a lot less green in the inhabited parts. Add to that all the formerly vacant community sites that are being developed, and so it goes. Kytie Mclign yes but without the 8 new townhouses 7 new single lots would have to be built on the outskirts of the city, cutting into ‘bush’ land. Population projections suugest that we somehow have to fit in as many people as lived in Canberra when i came here in the early 70's. There was no Tuggeranong. No Belconnen beyond Gininderra Drive. Where do we put them? Yeah let’s just keep sprawling out into the Brindabella mountains. Queanbeyan is looking better and much cheaper, every day. We need to get rid of Andrew Barr before he completely ruins our city. Here is where I have a problem with this bush capital idea. Simple fact is Australia is growing, Canberra is growing. We have two ways to house them. More urban sprawl which eats up “bush land” or higher density which either replaces older housing stock or takes up pockets of green in existing suburbs. So either way “bush” is being utilised. Just like how bush was utilised to build everyone’s little bit of Canberra. But gather we are all happy with that hey? Yes. It’s already gone in those parts developed after self-government and I can’t see it coming back. Developers and the government can both make a motza for the current shoddy developments. If they were required to develop to reasonable standards the costs would be astronomical – or at least what they charged would. Even before self government much of the land that has been developed in the past 30 years in existing suburbs was reserved for that very purpose. The NCDC even kindly signed such land as “for future development”. Kinda says to me even in the NCDC days they foresaw and allowed for much of what is happening now.